Wednesday the 11th of April saw two events celebrating the official opening of Neami’s new alternative to admission service, Nundah House. 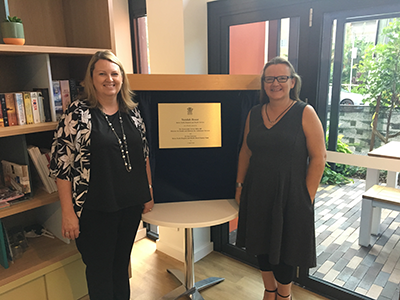 One event had The Hon Dr Steven Miles, Queensland’s Minister for Health, unveiling the plaque and officially opening the service. The other event was a celebration of Nundah House, and sector staff, consumers and carers gathered and cut a celebratory cake. The Brisbane Times mentioned the new facility in an article about the drive to change Queensland’s mental health strategy. Nundah House provides a recovery-focused model of Step Up Step Down care. Offering short-term, residential rehabilitation and recovery services Nundah House will play an effective role in avoiding hospitalisation, supporting rehabilitation, reducing the need for admission and transitioning back into the community following acute care. “We have achieved the goal of developing a facility that is warm and welcoming and everyone was impressed that the facility looks and feels more like a home, rather than a hospital ward setting.” Adam reflected. Adam also spoke of the warm environment of Nundah House, saying “The non-clinical atmosphere was noted and commended, in particular by the carers and consumers that attended”. Nundah House is now accepting referrals via Queensland Health mental health staff. For more information about Nundah House, feel free to contact Adam Weatherill.